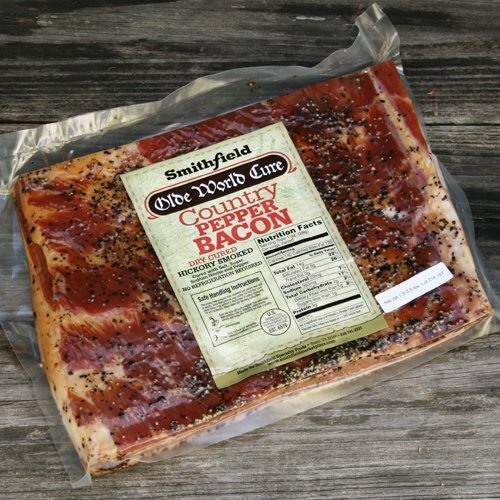 Our dry cured, hickory smoked bacon is deliciously succulent. 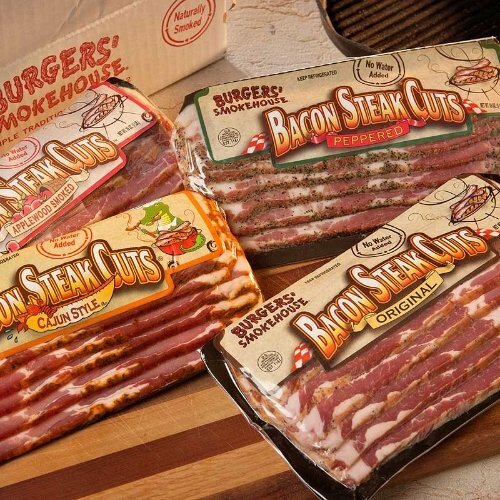 Our aging process means that our thick, hearty bacon won’t shrink even under the harshest of cooking conditions. 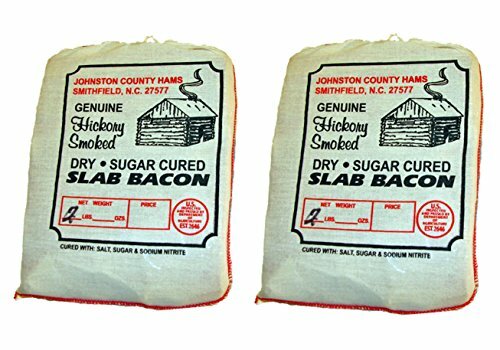 The unique flavor and sweet aroma of our country bacon is uniquely Johnston County. Refrigerate upon arrival. 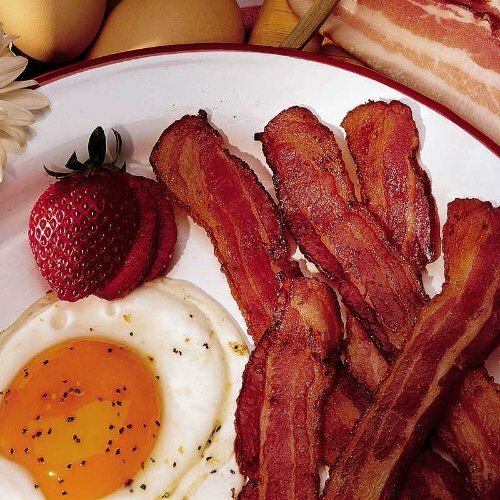 Fry over medium heat in skillet until slices are 160 degrees Fahrenheit. 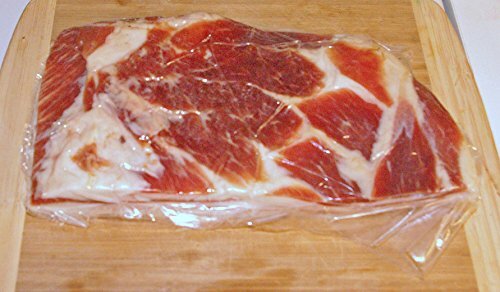 Pre-soak slices to reduce the saltiness and the resulting bacon with be fatter than grocery store bought sliced bacon after cooking. 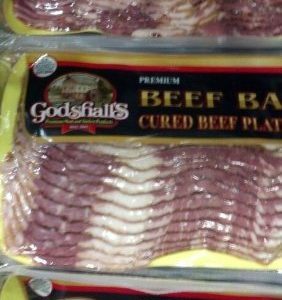 Note: This is cured the old fashioned way with salt and does not require refrigeration for shipment. It has a shelf life of three months. Refrigerating or freezing upon receipt will extend quality and life of the product. 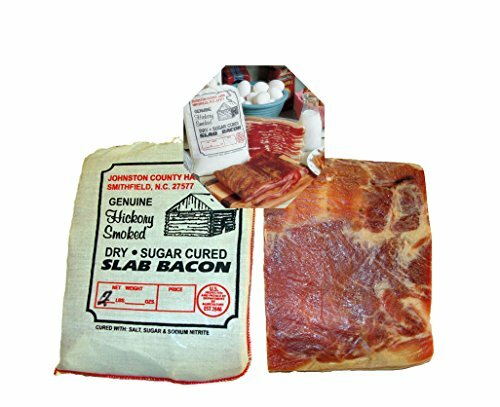 All products are USDA inspected and meet all USDA shipping requirements for safety Richard’s Review: The slab of bacon looked so inviting, I sliced a few pieces off of the slab and cooked in my cast iron skillet. Since I really like salty cured meat, I did not pre-soak to remove some of the salty taste. I had to cut each slice into two pieces to make them fit better in my skillet. They cooked up nice and brown with little shrinkage. 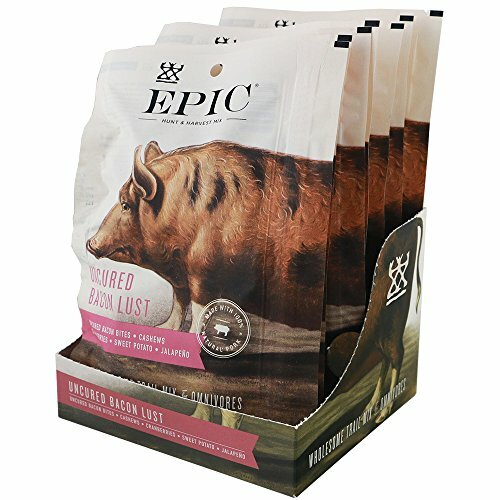 I also thought I would use our red eye gravy mix (1 heaping tsp with 3/4 cup water) and make a nice meal of bacon, biscuits and ted eye gravy. 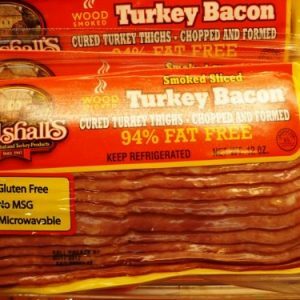 Well I love the bacon, it was crispy and sort of a mix between streak o’ lean and bacon. I really liked the biscuits with lots of red eye gravy and the hickory smoked taste of the slab bacon. I had a nice cup of dark roast coffee and finished it off with another biscuit with butter and sour wood Honey. Mmmmm Good!